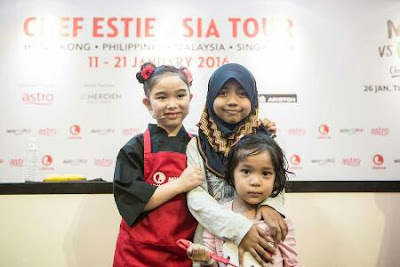 Last Saturday we went to see Chef Estie during her Asia Tour cooking demonstration. I do impress with her skill. Truly a great chef in the making. So don't miss the opportunity to see Estie in action on 26th January 2016 channel 709 at 7pm. Executive Chef Frank Otte tests his mettle against a team of five child cooking prodigies; from "finger foods" to a "technique trio," can this acclaimed executive chef hold his own against 7-year old child chef Estie? Master Chef Suzanne Tracht joins to blind taste and judge the winner takes all final round. During the last school holidays, the kids spent a few weeks at my PIL's house as hubby was out station. They were spending those days watching tv all day long. You know where datuk and nenek will always granted their wishes. So they keep watching cartoons until I came back from office. The 5pm session is for their nenek's slot watching Indonesian drama :p and after that I will filter all the programmes that they watched. I do not allow any re-run of cartoons, so either I will force them to watch cooking shows or documentaries. Then they became hook with cooking shows especially those featuring children as the chef. 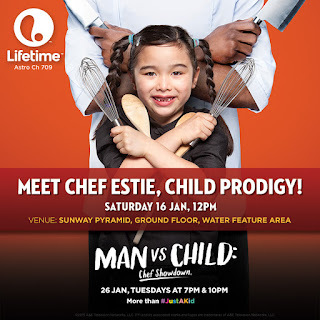 So the upcoming show "MAN VS CHILD: CHEF SHOWDOWN" which will be on air for the first time on 26th January on Lifetime channel will surely be on our list of programmes to be watched. The "Man vs. Child: Chef Showdown" is where the young chefs aged 7-14 put their considerable shills against fully-trained and accomplished chefs.